SHANKHNAD.ORG: VANDE MATARAM-TIME TO RESTORE GLORY OG MOTHRT INDIA. VANDE MATARAM-TIME TO RESTORE GLORY OG MOTHRT INDIA. TIME TO RESTORE LOST GLORY OF VANDE MATRAM-RASHTRA GAN. Thou who saves, arise and save! 'Vande Mataram' is well known as the National Song of our country. In this song, the two words 'Vande Mataram' have achieved major importance. These are the only words that many freedom fighters remembered while being sentenced to rigorous punishments in Court or being hanged to death. Muslim organisations have objected to this song. They opine that it is against the 'Shariyat'. In this country, whether something is right or wrong is determined on the basis of the Indian Constitution. Yet Muslims are demanding total elimination of 'Vande Mataram' on the basis of the 'Shariyat' law. Let us learn about the history of 'Vande Mataram' in the context of the Muslim opposition to it. The greatness of the motherland is the essence of Hindu culture. Every ruler, right from Lord Rama to Chhatrapati Shivaji Maharaj, has had a deep sense of belonging for the Motherland. After the killing of Raavana, when Lord Rama was presented with a proposal to stay back in Lanka, His very famous reply was, "Janani Janmabhumishcha Swargaadapi Gariyasi" Lord Rama says, "My mother and motherland are dearer to me than heaven (let alone Lanka)". There is no reason for the song 'Vande Mataram' to smell of a specific religion. Which beloved son will not hold this land, which is sujala, sufala and sashya shamala, in high regard? Who will not salute the motherland who is prosperous, meritorious and bestower of riches? It the implied meaning of this song is contemplated upon, the heart gets filled with pride for this land named "Bharat". The national Mahamantra Bankimchandra wrote the song 'Vande Mataram' on 7th November, 1875. This lunar day was Kartik Shukla Navami! 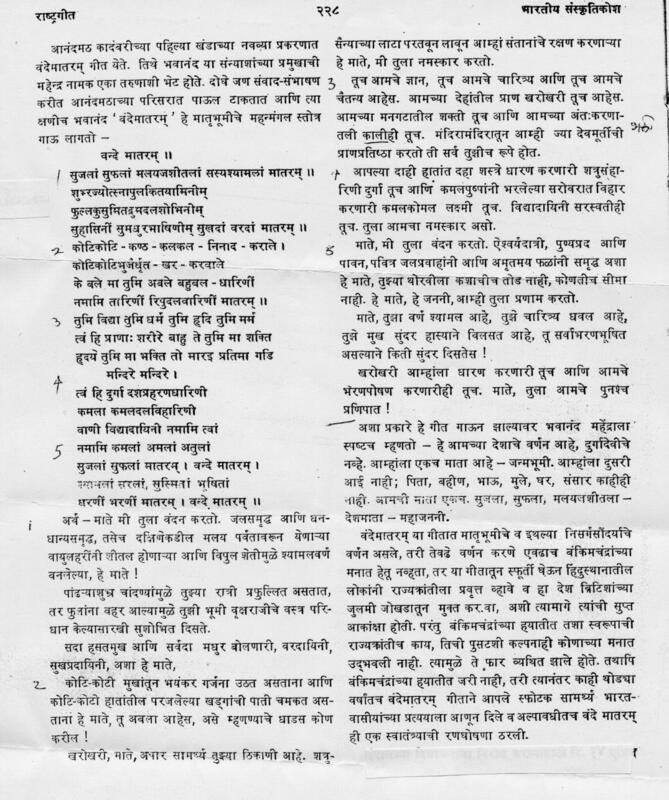 This song had been published in the novel 'Anandmath' by Bankimchandra. The vocabulary used in this song is influenced by Sanskrit. The said book contains information about the violent revolt of Sanyasis against injustice inflicted by Muslims and the British in Bengal in the year 1772. In the year 1905, Lord Curzon declared the division of Bengal. Whole of Bengal revolted furiously in order to revoke this division. The two words 'Vande Mataram' encompassed the whole of Bengal. It was these words themselves that made the English rage with anger. Curzon's chela, i.e. the Governor of Bengal had imposed a legal ban on uttering the words 'Vande Mataram'. This ban resulted in 'Vande Mataram' getting nationwide importance. It became a National Mahamantra. 'Vande Mataram' became the favorite word of the freedom fighters. On 6th August 1906, a daily newspaper was brought out in the name 'Vande Mataram'. Any program related to the freedom struggle would be concluded only after saying 'Vande Mataram'. The National Flag decided upon by Sister Nivedita at the Kolkata Congress and the one hoisted by Madam Cama at the International Communist Conference held in Germany had the words 'Vande Mataram' boldly encrypted on it in the Devanagari script. The sessions of the All India Congress would start with the song 'Vande Mataram'. Utterance of the words 'Vande Mataram' gave freedom fighters and the common public the strength to withstand lathi blows on their heads and whiplashes on their open bodies. In 1905, the 21st session of the Congress was held at Varanasi (Benaras). During this session, the famed Bengali poetess and singer Sarladevi Chaudhurani sang the entire 'Vande Mataram'. Nowadays, we just sing the first stanza of 'Vande Mataram'. Many among the new generation do not even know how big it is! In the year 1937, during the meeting of the Congress Working Committee in Kolkata, it was decided to cut short this National Song, with the sole motive of appeasing Muslims. Thus began the era of misfortune of this song! The Muslims were not satisfied even then. They wanted to eliminate this song completely. On 17th March, 1938, the Chairman of the Muslim League, Barrister Jinnah raised objection to reciting the first stanza of 'Vande Mataram' also. In 1940, Rules and Regulations framed for the Congress members restricted them from using the adage 'Vande Mataram'. When Muslims objected to the usage of 'Vande Mataram' in the working of the Constitutional Conference, they were granted permission to sing an Urdu song written by Bashir Ahmed. Likewise, they were also permitted to recite some stanzas from the Koran. In 1937 in many regions of India, Congress Ministry came to power in authority. Some may have thought that now 'Now good days will come for 'Vande Mataram', but it also proved false. In the process of Muslim appeasement there was strict prohibition of singing of 'Vande Mataram' on All India Radio. The famous singer Master Krushnrao gave a big fight for this. He did not sing on All India Radio for many years in the pretext of 'If there is no 'Vande Mataram' on radio, then there is no song of mine'. In March 1947 on account of Respected Krushnrao's efforts, the ban on 'Vande Mataram' was removed. The great poet Ravindranath Tagore publicly sang this song 'Vande Mataram' in Calcutta in 1896. He devised his own tune for this. The 'Kaafi' tune framed by Pt.Vishnu Digamber Palusker gained wide publicity. The song is song in other tunes besides the 'Kaafi' tune. The song was first publicly sung in 'Kaafi' tune in Lahore through the mouth of dynamic; illustrious Pt. Palusker. The present one to be broadcasted from All India Radio is in 'Sarang' tune. The reason given by Pandit Jawaharlal Nehru for 'Vande Mataram' not to become the National song was that it would not be able to rhyme it with the band, but Respected Krushnrao Fulmbrikar proved this wrong in a scientific manner. The efforts of Krushnrao Fulmbrikar were so enormous that he earned the title of 'Vande Mataram Krushnrao'. Shri. Amarendra Gadgil has written a book named 'Historical story of Vande Mataram'. In this book it is mentioned he says 'There was no reason for the actual discussion of what should be the National song in Free India, but due to the weakness in 1937 that the Congress despised 'Vande Mataram' of Congress, with the same weakness further Pt. Nehru removed this patriotic song from the place of National song. In 1937 when Congress Ministry became the part of regional administration, the relation that Congress means government has been set in this country. Pt. Nehru after managing all the facets of democracy, till the end carried his rule uninterruptedly like an independent Emperor. (Kruschov has given him the title of 'Democratic Dictator'!). As a result the situation that 'whatever Congress says is the law and what Pt. Nehru says is Congress' continued even after Nehru's rule. The national sin of deprivation of the 'Vande Mataram' as National song from its lawful place has been committed because of these two, means this song only in the silly pretext of music became the victim of politics and Nehru ideology. There is strong enough evidence to believe that Nehru had pre decided about not allowing this song as the National song. Finally on 24th January 1950, that is two days before declaration of India's Republic, the Constitution Committee put its seal on 'Jana Gana Mana' as the National song. Though the precedence of sacrifice of the national interest for the sake of politics, for one's self esteem and selfish party motives started by Congress and Pt. Nehru is still continuing today, it does not mean that it is acceptable to the whole country or the further generations. It is very mandatory for those who have affection for this history, especially the young ones of the new generations as their national duty to rethink about 'Vande Mataram'. Although the Constitution has taken away the place of 'Vande Mataram', it is not impossible to restore it. INDIA UNDER SEIZE-WAKE UP CALL. राष्ट्र-धर्मके रक्षक श्री गुरु गोविंदसिंह ! हिंदु रहना जातिवादी रहना नहीं है ! ISIL vow to demolish Kaaba -way to go.